"This is a favorite of mine! My stepmom and I first made this my freshman year in college as an experiment, and I have been making it ever since. May be served hot or cold." Bring brown rice and water to a boil in a saucepan over high heat. Reduce heat to medium-low; cover and simmer until rice is tender and the liquid is absorbed, 45 to 50 minutes. Combine red bell pepper, peas, raisins, onion, and olives in a bowl. Whisk vegetable oil, vinegar, and mustard together in a separate bowl for the balsamic dressing. Stir brown rice and balsamic dressing into vegetable mixture. Season with salt and black pepper. 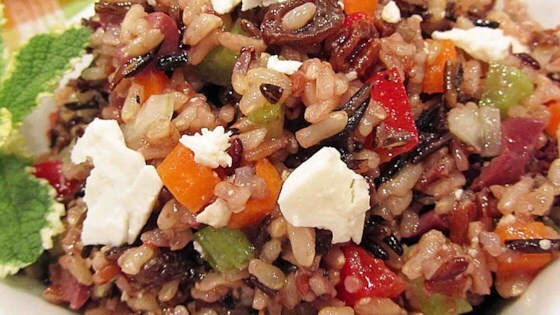 Top brown rice and vegetables with feta cheese before serving. A chilled grain salad with sun-dried tomatoes in a balsamic dressing. Used olive oil, white balsamic, and soaked the raisins in warm water for five minutes or so to soften. Tried it on my husband then made it for a party. It was a big hit! This recipe is excellent! I made no changes. It is a tasty healthy meal to pack for lunch.